Ruthiebear (Titusville, NJ, United States) on 27 October 2014 in Lifestyle & Culture. It does not even bear thinking about . . terrifying. @Marie-France: Friday's image will be the spookiest of all of my images of this place! Ughhhh, old and painful memories don't go away! Just looking at it hurts my mouth !!! Wonderful, treatment is beautiful, it reminds me of a drawing. It's always lugubrious, I never dare to go alone in such building. Superb treatment ! Wonderful image! Hmmm - I'm not fond of the dentist at the best of times, this would not help at all. Superb frame and processing ! Time has done its job. Everywhere is shown that these pictures tell that there was ever life. Now I see why some people had a fear of the dentist!! Great capture and processing!! Beautiful color and detail! The place just looks frozen in time. Wonderful HDR and processing! brilliant texture and color Ruthiebear! Excellent HDR. Come to think of it, I need to see the dentist. I like the texture here and the various colors. Like I said, Halloween is coming. 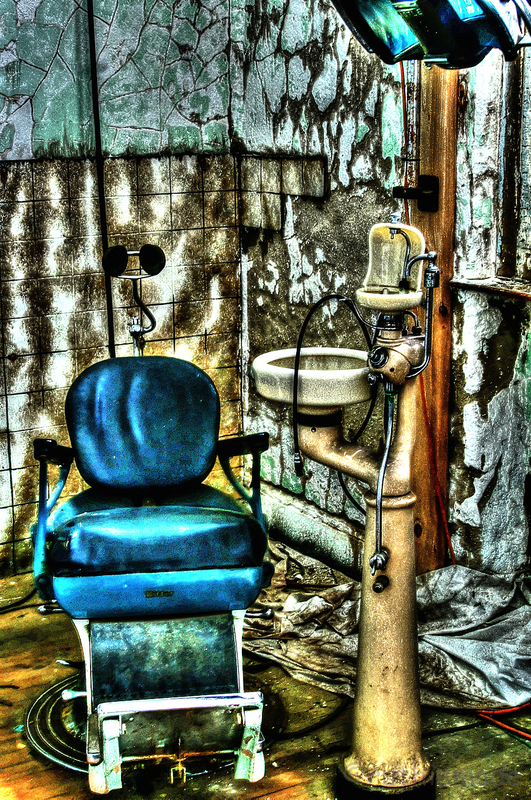 What is more frightening than a dentist's chair? Excellent photo, nice series ! A definite nightmare scene, made even scarier by the HDR emphasis. That that is a scary shot!